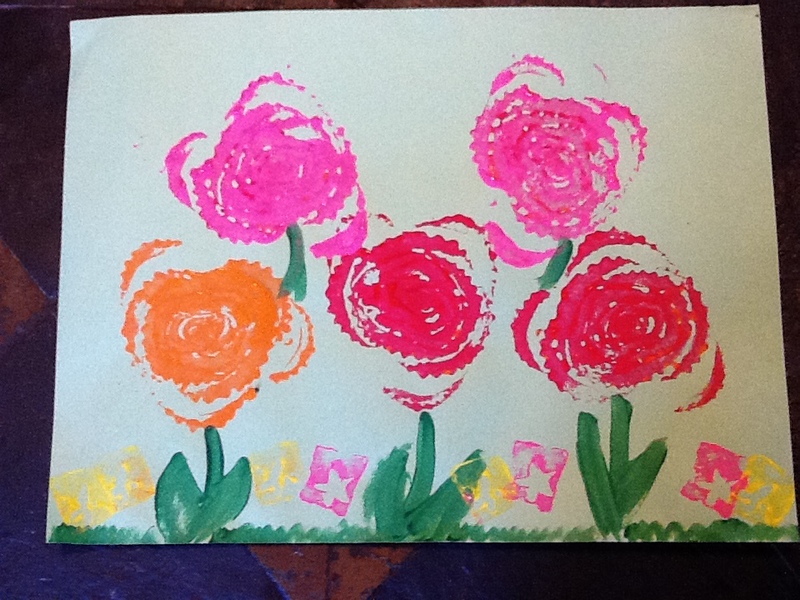 Daily Messes: Spring Into Fun! *Mine love making crafts, so we made celery stamps artwork (picture above). 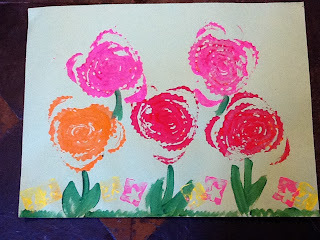 I cut the bottom off a stalk of celery, brushed on a some paint and let the kids stamp away. 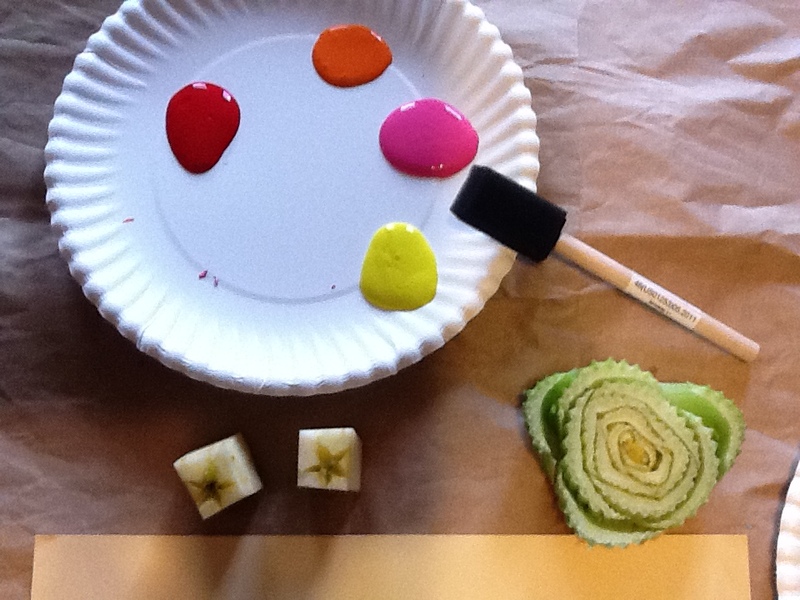 You want enough paint to coat the celery stalk, but you still want to see the individual stalks, not just a blob of paint. I added on the stems and leaves in green paint. The small star shaped stamps are from an apple core cut in half horizontally. I used a foam paint brush to brush the paint on the celery and my normal go-to craft paints (Rich Art Tempera Paint, which you can get at Michael's Craft Stores or here). *I remember making flower necklaces as a kid. Looking back, I realize it was clover flowers or other yard-type weeds. Now, I'm annoyed when they pop up because it means I have weeds, but at the time I thought they were pretty flowers. Have fun with your kids AND get rid of weeds at the same! Just pick the weeds, I mean flowers, and tie together! *Let them help you plant flowers. You know they want to dig in the dirt anyway! Put their energy to good use. *Go to a local farmer's market. We started going a couple of years ago. We enjoy walking around, seeing who our food comes from, and supporting the local farmers. 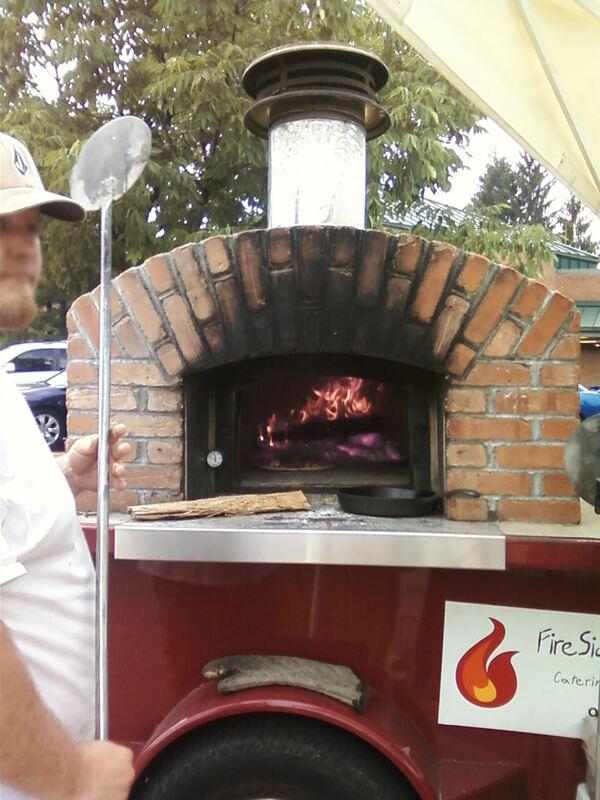 You never know what you are going to see: sometimes there are puppies for sale, sometimes balloon animals, and sometimes made-for-you wood fired pizza! The kids like helping pick out fruits and vegetables. I also try to use it as a chance to try to teach them about money; we compare prices between stalls and I let them pay and get the change. If you want to find a farmer's market near you, try this site (or you can Google "farmer's market" and your zip code).